Linley, K A. 2015. 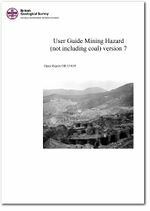 User Guide Mining Hazard (not including coal) v7. British Geological Survey Internal Report, OR/15/039. This page was last modified on 12 January 2016, at 17:41.